What’s in my fridge (Stockholm): a paleo grocery list | eat. live. paleo. There are everyday staples I always try to keep in my kitchen these days — my paleo grocery list. Although I miss our kitchen at home, our little kitchen in Stockholm has served us well so far; and with these basic items in our house, I find that I can usually cook something very simply. With basic staples, all we need to worry about is picking up proteins and replenishing the vegetables as needed. We try to buy organic whenever possible. PROTEIN: depends — we usually have at most 3 of the following, so I could have proteins ready to cook, but thye don’t sit in the fridge so long that they go bad or not fresh anymore: chicken (skinless thighs for curry, half chickens for roast); pork chops; veal chops; steaks; ground beef; ground lamb; salmon. 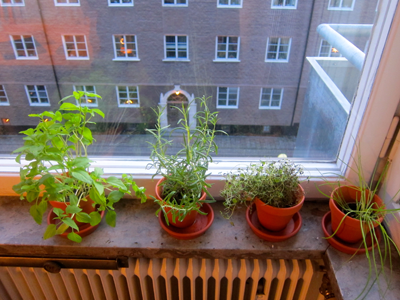 I like having potted herbs on hand — they help give a furnished-rental a more cozy, homey vibe — I currently have organic Thai basil, chives, rosemary and thyme.